"Pretty as a picture and easy as pie", Montipora corals are the easiest of the small polyp stony (SPS) to keep! What Do Montipora Corals Look Like? Montipora corals are considered the easiest of the small polyp stony (SPS) corals to keep. They are considered the best SPS corals for beginners, and keeping SPS corals is very rewarding for experienced reef keepers too. The first SPS corals for all new reef keepers are the Montipora species. These attractive, velvety corals are tolerant of most water parameters including light and water flow. Just make sure your parameters for calcium are kept up and you can have a beautiful display of pinks, purples, green and everything in-between. These are not aggressive corals, but are rather more submissive. Take care to place them away from other corals to protect them and allow them to grow. The Montipora corals are the second largest genus of corals, with over 200 nominal species and more being recognized. They are second only to the Acropora genus, which has close to 400 nominal species. The Montipora corals, along with the Acropora, represent one third of all the 'reef building' corals. These corals come in all the colors of the rainbow and in many shapes. Their polyps are so tiny, they give many of these corals a fuzzy look, hence the name ‘velvet'. Others Monti's have polyps that are smaller still, and that simply makes those corals look stony. Montipora's have many different growth forms and can even have several types of formations within a single colony. Basically, you name your style, and there's a Montipora growth form that fits. The Montipora corals are some of the all around best corals for the aquarium industry. Good from the standpoint of harvesting from the wild, as they are easy to collect through fragmentation, leaving the mother colony intact. Though many Montiporas have encrusting forms, or can be so large that collection of them is difficult. They are good for all reef aquarists because of their hardiness. That and being easy to propagate makes them the best SPS corals for beginners. Many species are successfully propagated in captivity, and many more species are becoming available. Montipora Coral Facts The Montipora genus was described by de Blainville in 1830. They are the second largest genera of corals with the Acropora genus being the largest. So far there are just over 200 nominal species, but the total number is still unknown. Species that are encrusting corals or have very small plates have long been inconspicuous animals. Of the nominal species, 38 are found in Australia. Names they are known for are the Velvet Coral, Velvet Finger Coral, and Velvet Branch Coral. The Montipora genus have the smallest corallites of all the corals. They are often confused with Porites whose corallites are also extremely small. Because the polyps of most Montipora are small, aquarists refer to them as small polyp stony corals, or SPS corals. Montipora genus inhabit the entire Mediterranean Sea, and the Indo-Pacific Oceans from the east coast of Africa to the Pacific ocean, ending northward at the Hawaiian Island, and then extending southward to the Pitcairn Islands. They are commonly imported from Indonesia. They are found in a wide range of habitats and types of water movement, depending on the species. Habitats can range from deep waters, up to the reef crest; and from clear oceanic reefs to turbid lagoons and shallow areas. They are a major contributing coral for reef formations. In fact, between Montipora and Acropora corals, they make up one-third of all reef-building coral species. Montipora species have been propagated in captivity, thus helping to conserve wild populations in the world's reefs. Some of their growth forms have been included in common names such as staghorn coral, cat's paw coral, bottlebrush coral, table coral, tabletop coral, and plate coral. What Do Montipora Corals Look Like? Montipora is a plating species of small polyp stony (SPS) corals.The skeletal structures of the Montipora genus are lightweight and porous, with tiny openings for the polyps, barely visible in and around the coenosteum. Montipora corallites (the basic skeletal unit of a stony coral that contains the polyps) are tiny. They have the smallest corallites of all the corals. This makes them distinct from all other corals except Porites. The corallites have almost microscopic inward-projecting septa (plural of septum, a thin skeletal plate in stony corals that protrudes from the corallite wall inward, toward the center where the polyps reside). The polyps themselves are tiny, uniform, and on many species they are fuzzy. This gives Montipora one of it's common names, Velvet Coral. Others have polyps that are smaller still, and simply make the corals look stony. Unlike corals whose polyps expand or contract only at certain times of the day, Montipora polyps can be open or closed at any time of the day, they also can open singly or in groups. Montipora spp. are most commonly found in green, pink, purple, and brown but can be found in almost every color. The polyps tend to be brown or green, usually in contrast with the more brightly colored coenosarc (the soft tissue that lies over the stony skeleton and usually links the tissue between polyps). Some that are brown when collected can turn to blues and purples under the correct lighting. Lighting types include metal halides, high intensity VHO's, and T-5s; with some being happy with compact fluorescents. Montiporas can be flat encrusting, branching, laminar, or foliaccous, and most can have several formations of growth within a single colony. Colonies can have massive or thick plates, that can be with or without upward growths of columns, nodules, or other shapes.There are also colonies with thin plates. Some can have upright branches while others won't, and they can be with or without encrusting plates. Upright branching colonies mostly form like the well-known Montipora digitata. See each individual coral for more specific information. Keeping Montipora Corals Keeping stony corals itself is a step beyond a simple or beginner reef. Having reef-keeping experience is invaluable for successfully keeping hard corals. Keeping some of the less demanding inhabitants, such as the leather and soft corals, mushroom corals, and anemones, you can hone your skills. In general Montiporas are easier to keep than Acroporas. They're easy to moderate to care for, accepting a wide range of lighting, and less likely to bleach or get the diseases that the Acroporas corals tend to get. Finally they are easy to propagate. Unlike the finicky Aroproras, many Montipora species, once established, they are quite hardy and fast growing. All in all making them perfect specimens for the captive reef environment. Live Coral Care In general the Montipora coral likes medium to strong water movement, and prefers a turbulent flow. It requires strong light from sources such as VHO or metal halide. They are not hard to keep as long as these requirements and calcium levels are maintained. The growth form of a Montipora is a good indicator of what type of habitat they require. Those with smooth surfaces will need calmer water while those with a textured surfaces or convoluted in shape prefer higher water flow. The plate-like forms are from deeper waters. Those with lighter tips indicates they are fast growers, and those ringed around the margins with lighter colors indicates where the growth is happening. Montiporas do best in a reef tank, 10 gallons (38 L) or larger, that are stable. They must be at least a year old with very low nitrate levels. Provide a temperature range of 74-83 F (23 to 28 C) and a salinity (specific gravity) of 1.023-1.025. Lighting types include metal halides, high intensity VHO's, and T-5s, with some being happy with compact fluorescents. Keep the Montipora's placement in mind, too. Position the Monti's at the upper to mid levels depending on the light intensity. A Monti will show whether it is happy or not by the coloring. Make sure that no other corals or even algae that can come in contact with your Montipora. Monti's are mild mannered and will end up loosing any chemical warfare. Montipora Coral Feeding In the wild, Montipora corals have developed several feeding strategies to increase their survival in nutrient-poor waters. Montipora corals have a symbiotic relationship with a marine algae known as zooxanthellae, and they receive the majority of their nutrients from it. They have other feeding strategies as well, such as capturing planktonic organisms and ingesting microscopic food particles. They can also absorb dissolved organic matter. In captivity, they do well in well-feed reef tanks, accepting very fine particulate foods, zooplankton and tiny plankton can be fed once a week. Copepods, Artemia, and nauplii are too large for them to ingest, but new forms of prey are being developed, such as invert larvae and new strains of rotifers. Compatibility and Social Behaviors The Montipora genus are peaceful, but watch out for crabs. Many experienced aquarists do not believe in any crab should be kept in a closed system. Crabs are opportunistic predators, with the exception some of the symbiotic crabs like commensal crabs, and gall crabs. Although not as touchy as Acroporas, the Montipora genus should still be kept in a small polyp stony (SPS) tank. It will tolerate a mixed coral tank better than Acros, but plenty of room should be around your Montipora, even distancing it from another Montipora species. Oddly, colors can at times determine hierarchy in a tank. For instance, a brown Montipora digitata will usually loose to attacks by their colored up sisters and brothers. Coral Reproduction The Montipora Sp. are male and female and can reproduce both sexually and asexually. In the wild they reproduce sexually by releasing eggs and sperm at the same time, resulting in a fertilized egg which then forms into a free-swimming planula larva. Eventually the planula larvae settles onto the substrate, becoming plankters. 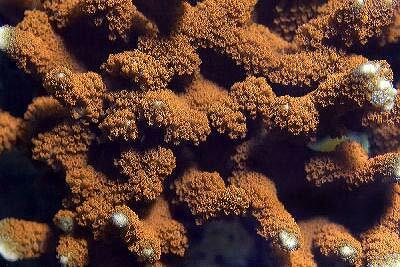 This then forms a tiny polyp which begins to excrete calcium carbonate and develops into a coral. Planula larvae are extremely vulnerable to predation, and very few survive. In the wild Montiporas reproduce asexually as well. The polyps at the tips of branching species secrete corallite around itself, forming longer branches. Montiporas also spread from breakage due to storms and fragmentation. SPS Coral Ailments There are various ailments that small polyp stony (SPS) corals fall victim to. The Montipora genus is generally disease resistant, but under poor conditions can still get the same illnesses that any other SPS can. There are tumor like growths that are common on some Montiporas, but these tumors are not harmful, just ugly. In general, if your Montipora genus has any kind of tissue recession, just cut off the unhealthy part. Just make sure you cut into some of the healthy part to be sure there is no disease already invisibly encroaching on the healthy tissue. Keep out cyanobacteria and algae too with good water movement, and your Montipora will stay happy. Corals For Sale Montiporas. are very easy to find at pet shops and on line. The cost for online stores is around $34.00 USD or more depending on size and color. Experience over the last few decades has strongly indicated that captive bred stony corals are much more adaptable and hardy than wild caught specimens. So it is better to acquire captive bred Montipora when possible. You'll not only get a more durable coral, but there are often many beautiful color specimens available.